As a youngster I eagerly awaited the arrival of the weekly comics: the Beano, Topper and Beezer. These gave me much-needed excitement from the adventures of my favourite heroes. For special occasions, rather than the usual Cowboys & Indian outfits, I’d wear a replica costume of Superman or Batman to boost the delusions that I might even temporarily possess incredible powers. One incident stands above the others out in my memories of those years; a beach campfire conversation between a group of us childhood friends. Iain told his parents he’d be staying over at my place; Davie and Sandy said the same to theirs. Donald said he’d be at Ian’s and I suggested I’d be at Donald’s. This was the mid 1960’s; our homes had the standard Bakelite phones they were rarely used. We knew no-one would check up on us. Where were we? 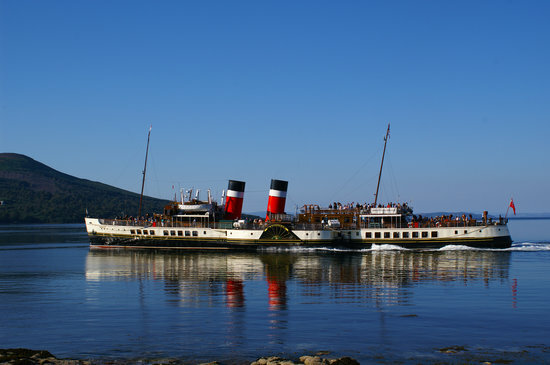 We’d gone with our bicycles on an early morning Clyde paddle steamer from Gourock to Tarbert on the Mull of Kintyre before cycling across the Mull until we reached a deserted beach with a clear view across the sea towards Islay. We were in our early teens. Invincible with huge futures ahead. We didn’t even have a tent; just sleeping bags and a good driftwood fire to keep us warm. It was the beginning of the Spring holidays in 1965; too early in the year for those pesky midges. In those days Spring was Spring. I remember long stretches of sunny weather and the vibrant colours of wildflowers. Or is it that we only remember sunny days because when it rains we stay indoors doing nothing in particular? The steamer reached Tarbert and we jumped onto our bikes to start the long, slow climb out of town. It was one of those carefree, wind-in-the-hair journeys where half a dozen cars at most passed us all day and we could cycle hands-free for miles. As the evening arrived and the sun was setting, we finished our home made sandwiches and Mars Bars and were holding marshmallows as close to the fire as our fingers could tolerate. Donald, the eldest in our group invited us to declare what superpower we’d choose if we could, adding quickly that he’d ‘bagged’ the ability to fly. “The strength of Hercules” chipped in Sandy before anyone else could speak. “Becoming invisible when I want” was Iain’s, leaving me to ponder what other superpowers were left. Davie, the joker in the pack claimed he already had a superpower because he got ‘A’ grades in Latin. When pressed for a real answer he chose time travel so he could go back to Roman times and warn Julius Caesar about the Ides of March. My attempts at claiming “flight, great strength and time travel” were turned down because they were already taken and we were only allowed one superpower each. I looked around at the expectant faces of my friends. They were home and dry with their choices and I sensed that they were waiting for me to come up with something trivial. Something they could laugh at. The look in their eyes was enough to trigger what I needed. “I want to know what people are really thinking when they speak” I said. The reason I remember that moment so many years later is that their reaction was priceless. Initially they laughed “That’s not a superpower!” as if to play down my choice. But after a few moments it dawned on them that this particular ability could be useful in real life. The ability to fly would clearly save quite a few air fares in life; great strength would keep the school bullies away, and granted, invisibility would be pretty cool, but my choice had set them thinking. I knew this because for quite some time the conversation turned to examples (mostly about parents and school teachers) of what it be to like to know what people are really thinking when they speak. I didn’t give that conversation much thought until the late 1990’s when I went to see Jim Carrey’s film “Liar, Liar”. If you haven’t already seen it, Jim’s son in the film, Max, is disappointed that his estranged father (Carrey) is always making empty promises. This time Carrey promises faithfully to come to his Max’s birthday party but, of course, doesn’t show up. Max makes a birthday wish that for just one day his father cannot tell a lie. What’s fascinating about the rest of the film is that however much Carrey tries to tell a lie (he’s a solicitor for Heaven’s sake! ), the truth comes out instead. Well it may surprise you to know that the superpower I opted for - to know what people are really thinking - is already available to anyone who wants it. You don’t have to be bitten by a radioactive spider to get it; all you have to do is read on, because it’s so easily within your reach. “There's a sign on the wall but she wants to be sure 'Cause you know sometimes words have two meanings." In the Beatle’s song “Rain”, John Lennon accidentally tape-spliced the end of the song backwards, but liked the result so much that the ‘error’ stayed in the final cut. This ‘mistake’ evolved into a series of bold experiments in the creation of special effects in the Beatles’ music. It was discovered that if a song was played backwards, coherent phrases could be made out. This became known as ‘backward masking’; there were two distinct types of this - intentional backward masking (what Lennon did with ‘Rain’) and unintentional backward masking, where unplanned messages are discernible amongst gibberish. It’s the latter we’re concerned with here. In the late 1980’s Australian researcher David Oates set about analysing thousands of recordings to conclude that embedded into the sounds of human speech is another form of mmunication; that Voice in Limbo. This was already evident when recordings were played backwards; Oates demonstrated its presence in normal speech, terming hidden messages in human communication, the unplanned messages as “Reverse Speech”. Embedded backwards into the sounds of human speech is another form of human commnication. As the human brain is constructing the sounds of speech it is forming these sounds in such a way that occasionally another message is said backwards. Whether sung or spoken, ‘reversed’ sentences can reveal distinct phrases. What’s more intriguing is that these phrases have a unique relationship with what is being spoken forwards at the time. Although Reverse Speech comes from many parts of the psyche it is not just one part of the mind speaking. The words spoken forwards come from the left brain hemisphere; the words in the reversal come from the right brain hemisphere. At times reversals can reflect conscious thoughts the speaker is aware of at the time, or emotions they were feeling. At other times they can communicate deeper thoughts the speaker has no conscious awareness of. They can also give instructions concerning life and decisions to be made, thought that are beyond out conscious awareness. They can tell if someone is telling the truth or if someone is lying. They can reveal unconscious thoughts that are either helping or harming us, and, at other levels still they will communicate in metaphors using images and symbols that are not in conscious awareness, but rather stem from a deeper area of consciousness. 1. Human Speech has two separate, yet complementary, functions and modes. One mode occurs overtly, is spoken forward and is under conscious control. The other mode occurs covertly, is spoken backwards and is not under conscious control. The backward mode of speech errors simultaneously with the forward mode and is a reversal of the forward speech sounds. 2. These two modes of speech, forward and backward, complement and are dependent on one another. One mode cannot be fully understood without the other mode. In the dynamics of interpersonal communication, both modes of speech combined communicate the total psyche of the person, conscious and unconscious. Now it’s easy to record political figures speaking backwards and reveal that they don’t mean what they say. But hey, they’re politicians; masters of deceit. Only the naive expect them to make good on their election promises. Along comes Reverse Speech and we now have access to the truth. Of the politicians, there are a wealth of false promises coming from the lips of George W. Bush, Barack Obama, Hillary Clinton, David Cameron and Teresa May. We've come to expect little else. Even the reversed recordings of Dwight Eisenhower and Richard Nixon expose their duplicity. Reverse Speech offers us the keys to the kingdom; an indispensible lantern. Maybe that's why the corrupt and destructive world of psychology and psychiatry and its deadly pharmaceuticals want no part of it. Listening to what politicians, celebrities or businessmen and women are saying is of less interest to me than discovering what I’m saying and what people in my immediate life are saying. Why? Because we’ll never get honest politicians, better leaders, forthright businessmen and women or more intrinsically-valued celebrities until we’ve restored our own integrity. The politicians etc only reflect the lack of connectedness in our fragmented society. This is the true value of Reverse Speech. You’ll remember from your English classes that a metaphor is a figure of speech in which a word or phrase is applied to an object or action to which it is not literally applicable. For example…..
On that Mull of Kintyre beach if I’d said “The sky was on fire with the setting sun”, I would have been using a metaphor to describe the sunset. In David Oates book ‘Unveiling The Truth’ he expands on this explaining that “…the subconscious mind monitors the physical body and warns us of trouble or disease.” The Deep Unconscious Mind is the next level of consciousness and thinks in pictures or metaphor. It’s these pictures and metaphors that create our dance of behaviour. When we change the pictures, we change the behaviour these pictures create. Practitioners of Neuro-Linguistic Programming (NLP) will recognise this as meta-language, a language in hidden form, masked by conscious language; through this language we can explore and further understand an innate human function. In Australia there’s an ancient rite of passage known as the ‘walkabout’. It’s a journey that indigenous male Aborigines embark on for anything up to six months to prepare them for the spiritual and traditional transition into manhood. During the walkabout boys as young as 13 years old trace the paths that their ancestors took to learn how they survived. The ‘Metawalk’, a combination of ‘metaphor’ and ‘walkabout’, is something you don’t have to be an Aborigine to do; it’s a walk through your unconscious mind, a vivid spiritual journey to create significant and lasting change. Metawalks are extraordinarily powerful, utilising the secrets of the unconscious that Reverse Speech unveils. and your behaviour is changed. * In 1980 a nine week old baby Azaria Chamberlain disappeared while her family was camping near Uluru (Ayers Rock) in Central Australia. The baby’s parents Linda and Michael Chamberlain claimed they saw a dingo take the child. An extensive three-day search of the area and an examination of the stomach contents of dingoes and wild dogs that were shot failed to find any traces of the baby. Then began the most protracted legal case ever witnessed in Australia. Lindy Chamberlain was charged with the baby’s murder, found to be guilty and sentenced to life imprisonment. In 1986 a vital piece of evidence was found by chance that proved her innocence. An English tourist fell to his death from Uluru. Although it was eight days before his remains were discovered, lying below the bluff where he’d lost his footing was an area full of dingo lairs. As police searched the area, looking for missing bones that might have been carried off by dingoes, they discovered a small item of clothing. It was quickly identified as the crucial missing piece of evidence from the Chamberlain case, Azaria Chamberlain's missing matinee jacket. Lindy Chamberlain was immediately released, the case re-opened and the Appeals Court overturned all convictions against the parents. Had the police access to Reverse Speech and accepted its use, millions of dollars of legal costs would have been saved and the destruction of the Chamberlain’s lives been avoided. Lindy Chamberlain’s speech reversals were totally congruent with her story. Had she been guilty, her reversals would have reflected that guilt. One recurring aspect of Reverse Speech is that the innocent do not defend their innocence in reverse. They simply describe what happened. The guilty always profess their guilt in reverse. 1. Listen to the Reverse Speech Blind Test right away. Everyone should do this. At first some of the reversals may seem unclear but with experience they become much easier to make out. David uses established operational procedures to ensure that the integrity and accuracy of reversals are not compromised by misinterpretation. 2. Buy David Oates’ latest book online to learn more. This book is not for the faint-hearted. It's a compelling read and will challenge ALL you believe to be true, casting doubt over the word of those ‘you are supposed to trust’ and awaken within you a desire to know more. More about yourself as well as about others. The book looks in great length at the research behind Reverse Speech, with almost forensic attention to accuracy and transparency – a standard many so called “proven” theories fall short of. Importantly it reveals why as humans we behave the way we do, something psychologists and theologists have sought for centuries. This book is more than just an autobiography, more than a reference book and more than a work of fiction could ever be... it reveals the truth. However the key to ALL change is doing. 3. Contact David Oates directly. Use the link to contact him as David will help you determine what the best options for you would be to break through those unconscious barriers and negative beliefs. David has a well-deserved reputation for bringing about lasting, life-changing breakthroughs! The consultation is free so you are invited contact him to determine what may takes place without any further obligation. You’ll learn prompting techniques and ways to build your own business. A small and dedicated group of Reverse Speech professionals will work together towards the common goal of expanding this phenomenon. A Reverse Speech Analyst will learn to understand how metaphors work in unison with each individual. More and more people are using this to get to profound levels in their own lives, their family and their clients. Join the next reverse speech training class and you can help us take this message out to the world. Are you ready for this level of truth? Note: Our trips to the Mull went undiscovered. I told my parents many years later, including in my admission a few other journeys my friends and I went on using similar white lies. Thankfully my parents weren’t concerned because we lived in an era that was comparatively safe.